Yesterday my kindergartner came home after a discussion about Dr. Martin Luther King Jr. at school and had questions. I was busy making dinner, answering questions about homework requirements, checking in about tutoring sessions, and listening to voicemail – you know that weary pre-dinner crazy that unifies and terrorizes all parents. I told my son to wait patiently and carried on in that crazy space. Then this. After waffle making, preparing lunches, double checking homework, seeing one to the middle school bus, and a husband out the door – THIS. A little boy who wants to talk about Dr. Martin Luther King Jr. because he has realized that if indeed he lived back when Dr. King lived, his sister would not have attended the same school, or been able to share a hamburger with him at his favorite restaurant, or play at the same playground, or go to church with him. He would be separated from her – AND – “would we even have been allowed to be a family Mom?” he wondered. So this morning I sat beside him on the couch and read books, and talked about our feelings when we know something to be unfair, and the responsibility to do something once you know, and the many realities of injustice. We talked about the reality that we STILL fight for these things; equality, justice, fairness. In the midst of all the responsibilities, and yes, forgetfulness of my life, there are few moments that I find signal this kind of importance. I can say honestly that this pause, this time spent together, this was the most important thing I will do all day. How about you? How are you talking, learning, and journeying together this weekend? 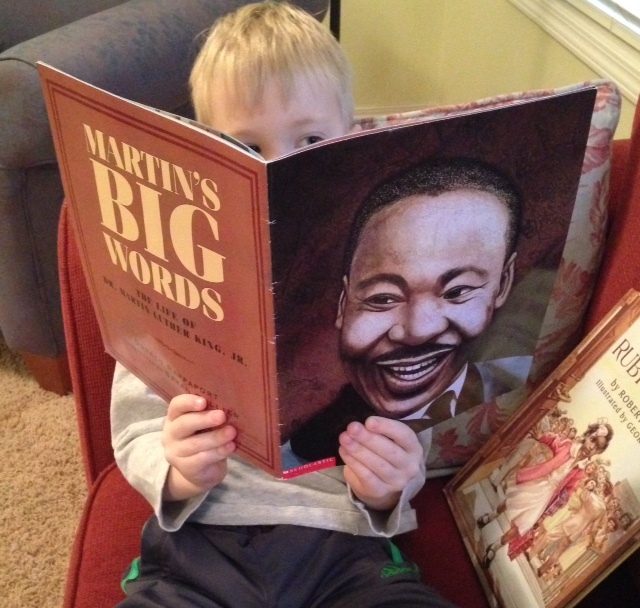 If you are looking for a way to celebrate and honor the legacy of Dr. King with your kids check out this post from last year that includes a simple way to begin engaging with your child. Attending a community gathering and remembrance for Martin Luther King Jr.
Come listen to Mrs. Myrlie Evers Williams, the widow of the late Medgar Evers (field representative for the NAACP was killed in his driveway in June 1963 as he came home from a meeting), who will be the keynote speaker at Temple Beth Israel at 6:00 PM Friday evening (tonight). Attend the AMA sponsored MLK Service at First AME Zion Church on Sunday, January 18th at 4:00 PM. Pastor J. Walter Hills of New Hope is the keynote preacher. On Monday, January 19th most of the day until evening the World Arts Council presents the Annual MLK Celebration at Highland Christian Center N.E. 76th & N.E. Glisan St. This event features a variety of speakers, singers, and presenters. On Sunday, February 15th at 2:00 PM at Vancouver Avenue First Baptist Church, at N. Vancouver and N. Fargo St., Dr. Bernice King will be the keynote speaker and the Reunion Choir and Pacific Youth Choir will be performing. Admission is $20.00. And this Sunday #PDXKids4Justice is holding a Human Rights Solidarity March gathering at Portland’s Peninsula Park on Rosa Parks Blvd and marching towards The Convention Center where the King statue stands for a rally. This is a kid friendly event.